The Best Regional Banknote Awards have been presented this week at the High Security Printing EMEA conference, with Armenia and Kyrgyzstan announced as the winners. 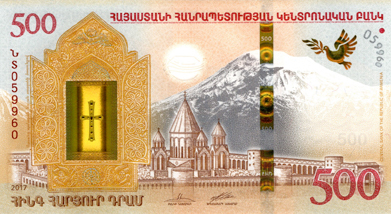 Armenia’s 500-dram commemorative banknote issued in November 2017 was a winner of the award, due to its “combination of the highest level of security and outstanding design techniques”. With a design theme of the biblical story of Noah’s Ark, the banknote’s security features include RollingStar® LEAD foil and Galaxy® micro-mirror 3D effect thread, both by Louisenthal. It is the first time either of these security features have been used in a banknote. The banknote is printed on Louisenthal’s Hybrid® paper-polymer combination substrate, and includes SICPA’s optically variable ink SPARK® Live Truspin feature. The 2,000-som commemorative banknote, also issued in November 2017, celebrates the 25th anniversary of independence and the establishment of its national currency. The banknote, designed by the Central Bank’s banknote designer Murat Sagimbaev, contains elements detailing both the Kyrgyz people and nature. The note includes Crane Currency’s MOTION® SURFACE™ foil stripe, an evolution of the company’s MOTION® micro-lens thread technology. Kurz’s KINEGRAM COLOR® holographic patch is also included, changing from the numerals “25” to the Kyrgyz national pattern. Read the press release from Reconnaissance International.